Unmissable Spring Sale offers with up to 1/3RD OFF EVERY Window, Door, Patio, French, Sash, Bi Folding Door... Plus get FREE upgrade to Extreme Windows worth at least £100 per window. And up to 1/3RD OFF EVERY Conservatory, Orangery and Solid Roof - saving you hundreds of £££'s off your home improvement. 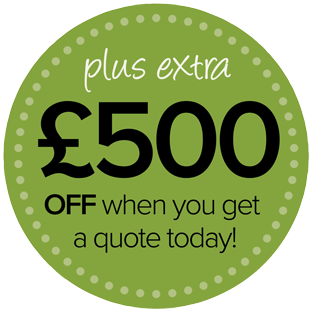 And for a limited period you can get up to an EXTRA £500 OFF your purchase when you request a priority quote below. Huge choice of designs in UPVC or aluminium. High quality Composite Doors and Timber Doors in a huge range of styles and colours. SAVE up to 1/3RD Off Shutters plus FREE FITTING! Huge choice of styles available - all made to measure. Over 30 paints and stain options available. Available in a choice of hardwood, PVC or Aluminium. We also provide a FREE design and measuring service. Click to view our NEW Shutter range. *Discount excludes all fitting and building works. Ask in showroom for details of our Price Promise. Upgrade our standard window to extreme collection. For a limited period only we are offering you extra savings of up to £500 off when you request a free quote. Simply fill in your details for your free, no obligation quotation, and click "Get Quote" to then receive your free discount voucher.